A smile can have a huge impact on a person’s self confidence. A gleaming white, straight, and beautiful smile is easy to show off and be proud of, inviting others to them and giving off an air of poise and sureness. A stained, chipped, or misaligned smile, on the other hand, can often cause people to hide behind closed lips and be reserved in social situations, often causing others to feel that they are standoffish or uninterested. Cosmetic dental veneers are thin shells that are attached to the front surfaces of teeth for an immediate smile transformation. Cosmetic dental veneers are customized for each patient of lifelike materials and have become incredibly popular in the last decade as a trusted procedure in cosmetic dentistry. At Gold Hill Dentistry, we are proud to offer patients that wish to enhance their smiles cosmetic dental veneers. We are a comprehensive dental practice with a talented and experienced cosmetic dentistry team that can help patients achieve the smile that they have always wanted. Cosmetic dental veneers are most commonly used to transform smiles that have gapped or misaligned teeth, stains, or for teeth that are chipped or broken. We take the time to consult with each one of our patients before moving forward with dental veneers to fully understand the look that s/he is trying to attain. Our goal is to help our patients achieve a smile that they are proud to show off! 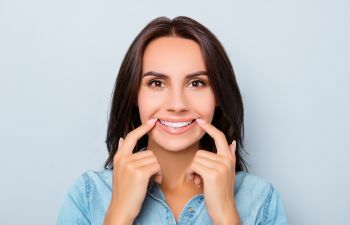 If you are interested in cosmetic dental veneers to transform your smile into one that you are proud to show your family, friends, co-workers, neighbors, and even strangers – then call Gold Hill Dentistry today to schedule your consultation. We are in the business of beautiful and healthy smiles, and we would love to help you find yours.